Just over a month remains before Congress decides whether to reauthorize the USA Patriot Act – the controversial post-9/11 law that serves as the backbone for surveillance. Critics and supporters are lobbying Congress to either ensure their needs are met. 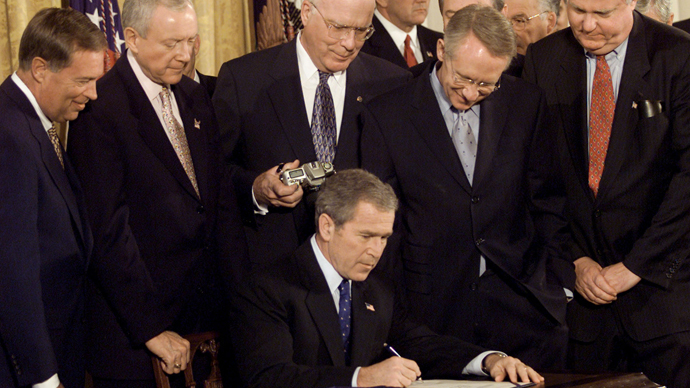 Several provisions of the Patriot Act, first signed during the Bush administration, are due to expire on June 1. The act’s ten provisions included enhancing domestic security against terrorists, improving intelligence gathering and sharing, as well as surveillance procedures. Critics say many of the provisions violate the US Constitution. The most controversial provision is Section 215, which permits US law enforcement and surveillance agencies to collect phone records and business records. It is the section that the National Security Agency (NSA) claims gave it authority to conduct mass surveillance of US phone records – authority that was exposed by whistleblower and former contractor Edward Snowden. Republican leaders of the House Intelligence Committee arranged for NSA and FBI representatives to brief members of Congress in secret briefings on Tuesday over the value of the Section 215, the Guardian reported. The domestic intelligence agencies are concerned that if the section is repealed or curtailed, they will lose investigative leads on domestic terrorism and espionage – including their ability to obtain data such as credit card information, hotel records and others that fall outside normal warrant or subpoena channels. Rep. Thomas Massie (R-Ky.) is a reform-minded lawmaker who last year sponsored an amendment with Rep. Zoe Lofgen (D-Calif.) that would have ended warrantless searches of Americans’ communications. He attended the briefing sessions but accused the government of sidestepping legitimate legal concerns. “Our question about constitutionality and legality were answered with statements of efficacy. We said, ‘How can this possibly be legal?’ and they would say, ‘this program works great, here’s how it’s helping us catch terrorists,” Massie told the Guardian. The groups say they face concerns from global customers over “the safety and security of their offerings,” and increased competition from foreign competitors and governments who use the US’ surveillance practices to lure business away from America. Congress has tried to reform provisions of the Patriot Act under the USA Freedom Act, which passed the House in May 2014 but failed to pass the Senate in November 2014. The White House supported the bill. One the provisions of the new bill would have extended Section 215 for another two years, which in the end unraveled support, especially from members like Senator Rand Paul (R-Ky.). The USA Freedom Act would do nothing to curb Section 206, known as the Roving Wiretap, which authorizes intelligence investigators to conduct roving surveillance with a single search warrant. It gives intelligence agencies a single wiretap order and allows them to listen in on any phone line or monitor any internet account that a suspect may be using – whether or not other people who are not suspects also regularly use it. Critics say it gives intelligence agencies a “blank check” to violate communications privacy of US citizens and residents. “We should be demanding more reforms than the intelligence agencies are gladly willing to offer us,” David Segal of the activist group Demand Progress said to the Guardian. Senate Intelligence Chairman Richard Burr (R-N.C.) has said he intends to push for a full reauthorization of the Patriot Act.